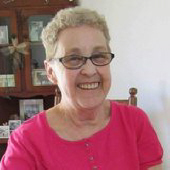 Mrs. Phyllis Ann Scott, age 82, passed away unexpectedly at her home, early Friday morning, March 15, 2019. She was born in Weymouth, MA, February 12, 1937, daughter of the late George and Margaret (Willis) Draper. June 16, 1957, she married William H. Scott, Jr. at the Immaculate Conception Church in Weymouth. Phyllis worked as a secretary for an insurance company in Massachusetts. When she and Bill moved to St. Albans, she began working here as a lunch lady at the St. Albans City School. She then went to become a sales lady at Knightes Pharmacy, Brooks Pharmacy, and most recently Rite Aid Pharmacy. She was a communicant of Holy Angels Church, and a member of the Franklin County Senior Center. Phyllis will fondly be remembered for her love of Bingo, knitting, enjoying her friends every Wednesday morning for breakfast, but most of all, her love of the time she spent with her family. Phyllis is survived by her husband William H. Scott, Jr. of St. Albans, her daughters Phyllis Scott and her husband Mike Bechard of Westford, Cheryl Rabtoy and her husband Marty of Wallingford, and Ellen Scott-Lamarche of Highgate Center, many grandchildren and great-grandchildren. Besides her parents, she was predeceased by her sons, William Scott, Thomas Scott, and David Scott, her sister Claire Scanlon, her brother George Draper, and recently, her son-in-law Marcel Lamarche. A Mass of Christian Burial will be celebrated Saturday, March 23, 2019 at 11:00 AM in Holy Angels Church. Interment will be later this spring in the Scott family lot in Mount Calvary Cemetery. The family will receive condolences on Friday, March 22, 2019, from 6:00 to 8:00 PM in the Brady & Levesque Funeral Home, 86 South Main St., St. Albans. Memorials may be made to the Franklin County Senior Center, 75 Messenger Street, St. Albans, VT 05478. Arrangements are entrusted to the Brady & Levesque Funeral Home, where online condolences and memories may be shared with her family at www.bradyandlevesque.com. To plant a tree in memory of Phyllis Ann Scott, please visit our Tribute Store. "Email Address" would like to share the life celebration of Phyllis Ann Scott. Click on the "link" to go to share a favorite memory or leave a condolence message for the family.